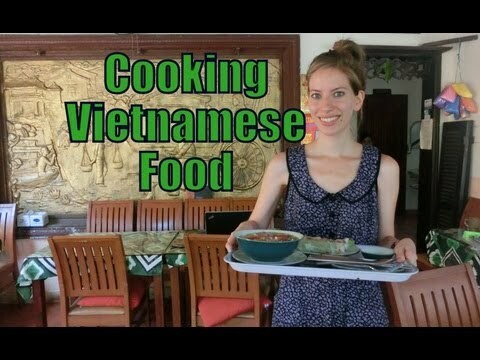 Recently having tried our hands at cooking a Khmer meal in Battambang, Cambodia we were thrilled to have an opportunity to try out a Vietnamese cooking class demonstration lesson at a local restaurant in Hoi An, Vietnam where we learned how to make Pho, Cao Lau, Spring Rolls and Country pancakes. Audrey and I both chuckle over the fact we spend more time cooking together when taking cooking classes than we do while traveling together. I suppose not having a kitchen in many of the places we stay at is a factor; however, we both would be the first to admit we’re not that skilled in the kitchen nor do we like to give up the comfort of having our meal prepared for us by someone else. Unlike the four hour lesson we recently completed in Battambang, Cambodia this was just a brief overview/demonstration in the back of the kitchen; it was more of a demonstration than anything else. For the most part we just watched as our host demonstrated how to make each dish. It was fascinating watching the speed, efficiency and confidence of this Vietnamese lady whipping up numerous dishes all at once. I really have respect for those talent at preparing food; it truly is an art form that certain people are masters at doing. Overall, it was a lovely experience; however, given it was already an exceptionally hot day, having to spend time in the kitchen was somewhat torturous and we were both relieved our slower pace of preparation was not relied upon too often. I was literally sweating buckets nearly the entire time in the kitchen. It felt like I was in a sauna. If we could do it over again, we would have chosen a rainy or overcast day when the temperature was several degrees cooler. To make all of these Vietnamese dishes we just paid a few extra dollars than what was listed on the menu prices; overall, we felt it was phenomenal value for the time and expertise of an accomplished whiz behind the kitchen. For those interested in doing the same thing, head over to Green Moss Restaurant and pick the dishes you’d like to learn; it’s just as simple as that.